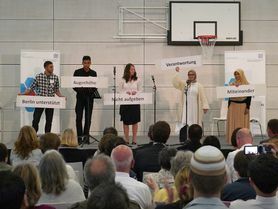 The German Institute for Community Organizing (DICO) is a focal point for the development of independent, broad-based citizens’ organizations using the model of community organizing and an interface between theory and practice for research in this and related areas. It supports the development of strong, democratic civil society institutions and the training of professionals –"reflective practitioners" - who serve organized civil society. The Institute is a pre-eminent center for community organizing in Germany. Germany, like other western countries, has been confronted by the dissolution of many traditional social institutions combined with growing individualism. This in turn has weakened social cohesion and eroded the credibility of democratic institutions. The events of 1989 in Europe (the so-called "Wendezeit" or "period of change") demonstrated the potential of civil society to bring about positive social and political change. The events also pointed out the potential of new methods to increase democratic participation and civic engagement – approaches distinct from the market and the state. These approaches include not only new forms of volunteerism and "corporate citizenship" but also new ways to expand the involvement and increase the efficacy of independent, self-organized citizens at the local level. To keep such discussions from remaining theoretical and academic, real life examples of broad based organizing are needed. Furthermore, those citizens and mediating institutions willing to try out this new model will also need advanced training, financial support and best-practice advice. A powerful and effective civil society will depend on two additional conditions: First, that people, groups and organizations on the margins of civil society be included and second, that this civil society have the ability to operate on its own initiative and potential and not on the those of the market or the state. Community organizing is a tried and true model for just this type of broad-based reconstruction of civil society. Community organizing operates independent of partisan politics and religious denomination in order to build practical and effective civic engagement from the ground up. The goal of organizing is to equip people with the skills needed to work with others to improve their own lives and the community’s shared life, and – in the process – to rebuild public life. In this way, both personal and communal efficacy is increased. Organizing takes the potential of formal democracy seriously and strives to make democracy both more lively and relevant at the local level. Community organizing can be seen as a "school of democracy" for people who have abandoned public life and for those who have never dared to participate in it. Above all, it requires working over the long haul with people and not simply for them. With the help of the civic platforms developed through community organizing, everyday people acquire the ability to negotiate eye-to-eye with serious economic and political leaders and in the process bring about concrete improvements in their lives and communities. The German Institute for Community Organizing was created to promote this practice of community organizing. Actually, it could not exist without real, on-the-ground organizing. This is best illustrated by the fact that many years of preliminary work by the citizens of Berlin in their neighborhoods – with the support of the Catholic University of Applied Sciences Berlin – preceded the institute’s establishment. They created and developed civic platforms that are firmly rooted in civil society. The success and expansion of these citizens’ organizations in Berlin and beyond prompted the creation of the Institute as a leading authority for community organizing in Germany. Promoting the exchange and transfer of best practices in broad-based community organizing in Germany and abroad. DICO is a research center of the Catholic University of Applied Sciences Berlin (KHSB). Its activities are financed exclusively by third-party sources. Bürgerplattform "WIN – Wir in Neukölln"
The Institute also has a special relationship with Verein Aufbruch – Broad-Based Community Organizing in Deutschland e.V. In addition, the Institute cooperates with organizing networks in Germany and abroad and with universities and institutes as well as associations, foundations and "corporate citizens" from the business sector. The Institute is currently working to develop formal relationships with The City Centre at Queen Mary University, London and the Great Cities Institute, University of Illinois at Chicago. Professor Dr. Leo J. Penta serves as the Director of the Institute. Assistant Director is Mrs Susanne Sander. Current members of the Institute are: Professor Dr. Petra Focks, Professor Angelika Pleger, Professor Dr Milena Riede and Professor Dr. Gaby Strassburger, all of the KHSB. Other members of the Institute include organizers Andreas Richter, Nirilalaina Andriamiharisoa, Marionka Pohl, Tobias Meier and Sonya Winterberg. An advisory committee supports the work and development of the Institute. The members of the advisory committee of the Institute are Loring Sittler, Generali Zukunftsfonds, Evelyn Fischer, chairperson of Berlins Presseclub, Dr. Jürgen Franzen, Hoffbauer gGmbH, John Kornblum, former US Ambassador to Germany, Prof. Dr. Andreas Lob-Hüdepohl, Catholic University of Applied Siences Berlin, and Dr. Andrea Mehrländer, Director of the Checkpoint-Charlie Foundation.